Zoho Mail is accessible through a web browser via its website but also through an email client on your phone or computer. One way this is possible is by enabling IMAP. When IMAP is enabled for Zoho Mail, messages that are downloaded to the email program can be deleted or moved and those same messages will be deleted or moved when you open your mail from any other program or website that's using Zoho Mail through the IMAP servers. In other words, you'll want to enable IMAP for your email if you like to keep everything synced. With IMAP, you can also read an email on your phone or computer and the same email will be marked as read when you log in to Zoho Mail on every other device. Open Zoho Mail Settings in your web browser. From the Mail accounts tile, choose IMAP Access. In the Mail Accounts dialog box, select IMAP Access. Launch folder settings: In Folder settings, place a check mark in the View in IMAP client and/or Notification columns to pick which folders should and should not be used over IMAP. It's normal to choose all folders, which is the default option, but you can deselect any of your email folders if you'd rather not use IMAP to download those messages. You might disable IMAP for a specific folder if you want to make sure that you can delete emails from your email program and have them stay in Zoho Mail when you access that same folder in your web browser or from a different device. In other words, if a folder is using IMAP and you remove an email from your email program within that folder, then it will be deleted from the server too, which means you won't be able to see it from that folder again even if you access Zoho Mail from a web browser or other email client. Auto-Expunge: Choose the Auto-Expunge Mails option to promptly remove emails from the Zoho Mail server when you delete them from your email program. Otherwise, select leave the option unchecked to delete messages from the server only after the local and online folders have synced. Either option is just fine to choose; the first will simply reflect changes in your account faster than the other. If you delete a message from your email program and then visit Zoho Mail in your browser shortly after, messages you delete should be deleted there too unless the folders haven't synced yet. Now that IMAP has been turned on, you can input the email server settings for Zoho Mail into the email program. 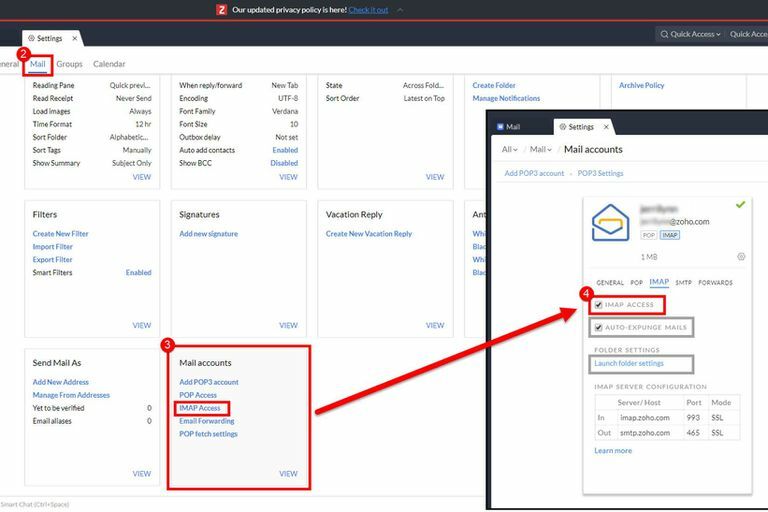 These settings are required in order to explain to the application how to access your account to download and send mail on your behalf. You need the Zoho Mail IMAP server settings for downloading mail to the program and the Zoho Mail SMTP server settings to send mail through the program. Visit those links for the Zoho Mail email server settings. Looking for the Zoho Mail IMAP Settings? What Are the Zoho Mail Exchange ActiveSync Settings?